Let's see now, you're looking for a stylish daily driver that will have enough room for the four kids, Aunt Mabel, the family pet and two week's worth of groceries. It needs to have good visibility, plenty of power for passing and well, if it hits the budget a little harder than a compact, that's OK because it will see far more use. We're talking about a sport utility vehicle, right? Well, almost. In the mid- to late-50s the closest thing you could get to one of today's sport-useless vehicles was Chevrolet's then all-new Bel Air Nomad station wagon. One could argue that the Nomad was the precursor to today's sport-ute, but at least this family hauler had style by the bucketload and utilitarian functions that didn't require one to join the Foreign Legion in order to make use of them. Sure, one might argue that Carl Renner's sporty new wagon with two-doors wasn't as practical as a four-door model, but with the rear seats folded flat, there was ample space for loading big bulky items in the upscale interior if necessary. Making its debut in 1955, the Nomad was an industry first in that it was created as a sporty station wagon. Though it shared an interesting parallel with today's sport-utes in regards to its price (at $2,571, it was the highest priced Chevrolet model of the year) it at least wasn't based on a truck chassis. Instead, it utilized the Bel Air's underpinnings and driveline options. For styling, it was unmistakable on the road. It shared the Bel Air line's unique eyebrow trim overhanging the headlights, which swept back almost to the end of the door. It was the treatment at the rear end for which the Nomad became famed though. Featuring a steeply raked rear window that dropped into the tailgate, the rear pillar was moved inboard thanks to long glass side windows that followed the roof's curve around the rear, eliminating the typical station wagon blind spots. The sporty aspect was evidenced by its backswept B-pillar that matched the rear window's rake. Seven vertical spears on the tailgate were a trademark Nomad feature that gave it complete individuality. Most likely because of its princely price tag, only 8,386 1955 Bel Air Nomads were built and sold in '55. 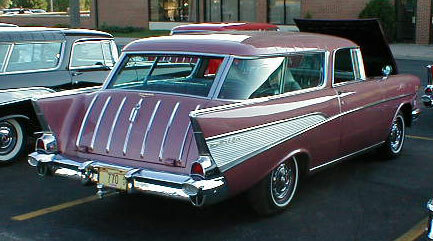 1957 was the final year that the Nomad was derived from the Bel Air line. In following years, Chevrolet separated out its station wagon offerings as a separate line, with a four-door Nomad as the top level family wagon. By this time, it had gained the same styling cues appearing throughout much of the industry. Wide and heavy bullet-nosed bumpers, full body-length chrome spears that branched around a wide fletching of anodized aluminum on the rear quarter panels and those unique-to-the-Bel Air line gold triple chevrons attached to the fenders just aft of the headlamps. Just 6,103 rolled off of dealer's lots that year, but in retrospect where these wagons didn't sell when new, they've certainly attracted a good following in the collector car market. A strong No.1 example of a '57 sold for $67,000 at the Barrett-Jackson Scottsdale auction earlier this year, with a strong No. 2/borderline No. 1 example moving to a new owner at the same auction for $42,000. Based on recent listings in Hemmings Motor News, the average buyer interested in adding a Nomad to the family fleet can expect to spend up to $25,000 for a No. 2-3 driver, that is one with nice paint, needing no cosmetic or mechanical work. Getting in at the enthusiast's fixxer-upper level (condition No. 3-4) will set one back anywhere from $10,000 to $15,000. At this point, you've got a driver that will likely need some cosmetic refurbishment and minor mechanical tinkering.